Long on the wish list and one ‘killer app’ missing from the iPad was a decent outliner. 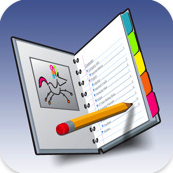 Circus Ponies Notebook, an outliner and much, much more, is now available as an iPad app. For those unfamiliar with the product, Circus Ponies Notebook is a kind of outliner on steroids. Specifically, the application operates on a “traditional paper notebook” paradigm while incorporating the benefits of an electronic medium such as a word index of all words contained in the notebook. Notebook for iPad carries over from the Mac platform beautifully. Notebook itself begged for the existence of a tablet before the iPad came into existence. Now that the iPad is here, Notebook can really shine. 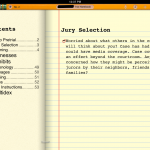 Notebook allows the user to take notes on a page in an outline format. Additionally, other electronic media can be incorporated onto the page. 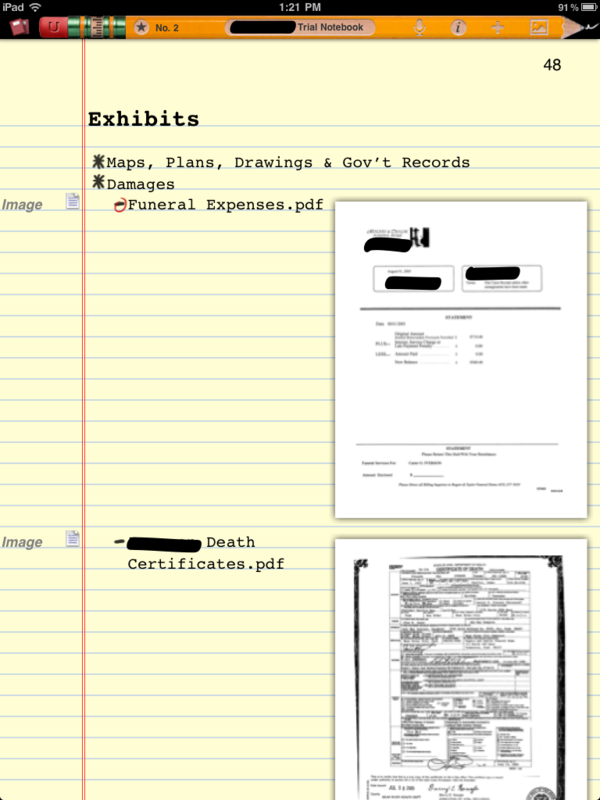 For example, an exhibit or pleading which exists in a PDF format can be dropped onto the page and either annotated/marked up using Notebooks annotation tools, or saved as a multipage PDF which will open for viewing. 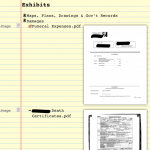 From a lawyer’s perspective, this allows building of a trial notebook, a notebook for oral arguments or hearings, or, a notebook containing all pertinent client/case matter information in one place. Ideally, the bulk of the heavy lifting would be done on a MacBook and then the individual Notebook would be synchronized to the iPad via iTunes. Thus, while an amazing leap forward for lawyers generally, Circus Ponies Notebook still does have some limitations, quirks and bugs at this time. For example, the need to synchronize Notebooks via iTunes is a kludge. Hopefully, the ability to synchronize via the ubiquitous Dropbox will come in a future release. Additionally, synchronizing back and forth between iPad and Desktop Notebook resulted in all tabs on the MacBook side being changed to a solid black color. A few other quirks are that the spiral bound notebook paradigm as a graphical user interface can sometimes be difficult to understand if you are accustomed to working with the standard menu/icon paradigm of computers. Also, some of the display features such as the dual page display became stuck during testing, requiring a power down and restart of the iPad to clear the graphical display. 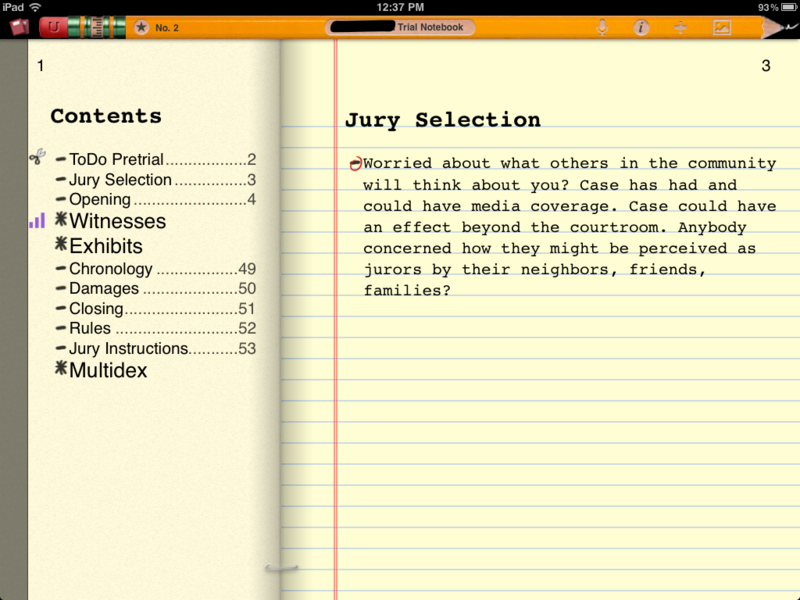 Some limitations also involve using Notebook while simultaneously using the iPad to present exhibits for a jury or bench trial. Right now, it does not appear that Notebook supports external displays. 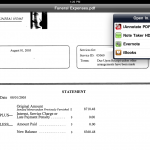 Accordingly, if during direct or cross-examination, the need arises to use the iPad to present a particular photo or PDF file, that file will need to be opened in another application such as iAnnotate, GoodReader or some other application. This has the downside of taking the lawyer away from the examination process, into another application to present the exhibit and away from the notes/examination outline. Hopefully, future versions will incorporate the ability to leverage an external display for exhibits, jpgs and the like. Finally, Notebook seems at times a bit sluggish while running on the iPad. However, despite these initial small first-generation hiccups, Notebook by Circus Ponies is definitely worth the $29 and goes a long way toward filling a much-needed slot in any litigator’s toolkit. 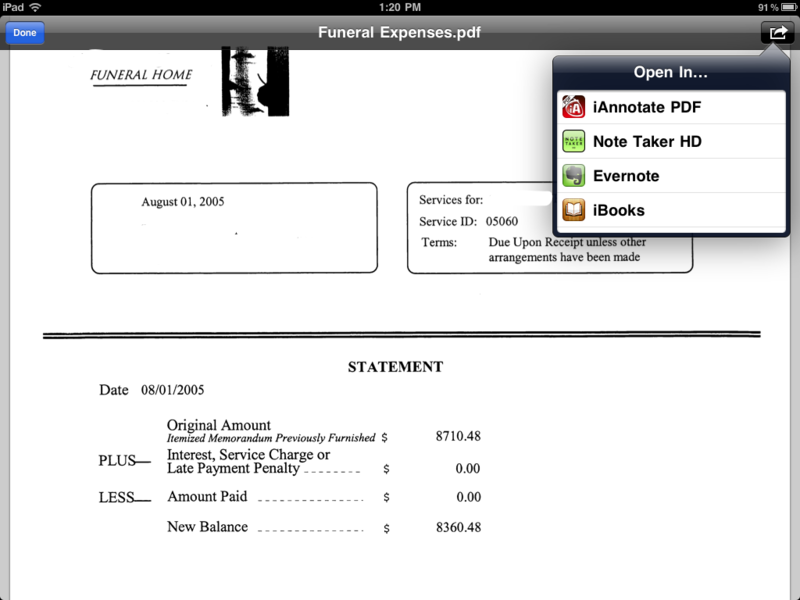 Sadly the iPad version is way too slow and way too buggy to be useable. I also question if the visual metaphor is an efficient use of the limited display space. I consider my purchase an investestment in the continuing development effort. The Mac-based product is, however, an essential part of my note-taking repertoire. @Wehba, agree laggy. But, even with the lag, it is still the best option available and far superior to the previous export-to-HTML and open-as-webpage work around. A functioning Multidex alone makes it worthwhile.